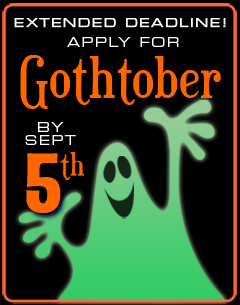 Gothtober Application Deadline EXTENDED to Sept. 5th! announcements Comments Off on Gothtober Application Deadline EXTENDED to Sept. 5th! CALL FOR GOTHTOBER PARTICIPANTS!!! THIS MEANS YOU!!! Due to the fact that I accidentally ERASED the Gothtober application data and it was down for a few days, some of you were unable to apply because nothing was there! I re-installed the data, and anyone who couldn’t find the form will have no trouble finding it now! Gothtober is an online advent-style calendar that counts down the days to Halloween, and it consists of 31 “doors”, each day revealing a Halloween treat made by a different contributor! We do this because we LOVE Halloween, and we love bringing everyone together engage with each other, make and do stuff and celebrate the season. It’s ART, goshdarnit! This blog is not Gothtober, this blog just tells you everything about Gothtober, if you want to see the calendar, go HERE. 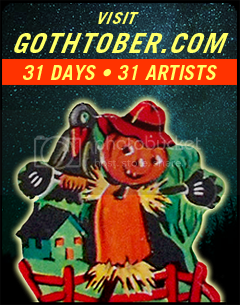 You don’t have to be an “artist” or an “expert” to be part of Gothtober, and we always need new blood so to speak. If all you have is snapshots and some napkins with words on them: I can help you turn that into a slideshow! This year we will actually be handing out AWARDS for various pieces, and we’re calling it “The Ichabods” complete with PRIZES! Prizes will be announced soon, we’re working on that, but please consider scrunching up your gray matter and making something fun or frightening for Gothtober’s Ghoulish Group for 2014, APPLY TODAY!